High-quality rugged connectors are complex and expensive. Connectors can be 1/3rd or more of the total BOM cost on some rugged products. Selecting a connector wisely is a crucial step in rugged design. Even when the connector type is predetermined by legacy or mating equipment, there are usually trade-offs. MIL type connectors often are available from many suppliers. Even for proprietary connectors, there are trade-offs to consider in terms of mounting style, retention and electrical connection and so on. We work extensively with Glenair for rugged connectors so I reached out to them for input with this article. Their comments are intermixed and noted. Thank you Glenair team for your help. Connectors that aren’t sealed are almost never an option for rugged design. If a connector is not sealed while UNMATED then expect trouble if the product is required to meet IP67 or IP68. It’s naive to expect users to always replace dust caps or keep cables plugged in. Water can travel through long cables in the spaces between wire strands like a capillary. An unsealed connector, even on the end of a cable is trouble even if over-molded. When a user inevitably leaves a dust cap off and gets water into the connector, they will blow it out, maybe even with compressed air. That will drive the water deep into the connector causing immediate failure now from shorting or failure later due to corrosion. There are lots of great connector manufacturers out there. Our favorite rugged connector manufacturer is Glenair as we have a lot of experience with their team and Mighty Mouse products. ODU, Amphenol, Omnetics, Souriau, Fischer, and Lemo also have great reputations but we have less experience with their products. There are new offerings all the time, and we regularly meet with connector reps showing off new product. Some of the great stuff we’ve seen recently are fine pitch (thus smaller) high-speed connectors, tiny wire-to-wire internal connectors and wipe-clean connectors. 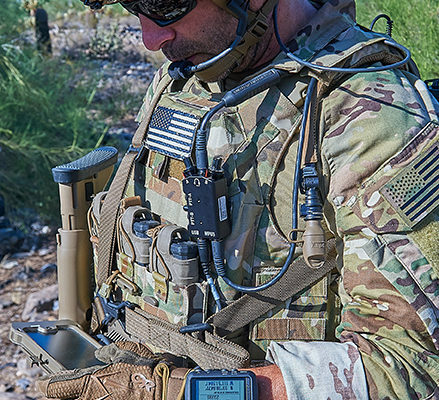 Regardless of the manufacturer, the number of options available to the rugged product designer is staggering. Selecting the right contact size is mostly a matter of picking one that can handle the amperage and voltage. Usually, the amperage is the limiting factor unless we are working on a high voltage application. When considering high voltage, high amperage, or high-speed data, we consult electrical experts – those aren’t rugged mechanical considerations. Also, there are a lot of available contact technologies. Durability and low resistance are the goals all manufacturers are chasing. Some have highly proprietary designs so they need to be considered, but again that’s mostly an electrical issue. We are concerned here about form factor and physical use trade-offs. Safety first, durability second. Almost by definition a rugged connector is exposed to the user. That means we need to think about safety first. If there is a potentially dangerous amount of power supplied by a connector, the contacts need to be protected from shocking the user. This usually means power sources are female receptacles with female sockets connected to a plug with male pins. Some manufacturers offer male plugs with female sockets which could be an option but this is less common. If safety is not a concern, the question of which part should have the plug and which the receptacle is one of form factor. It’s most common to put receptacles on housings and have plugs on cables. The biggest reason for this is drop protection. Plugs stick out and can be the first point of impact in a drop. This can be mitigated with some protective features like ribs or a recess in the housing design. Small shell sizes of even rugged plugs can be rendered useless with one hard impact. Cables do get knocked around when unplugged, but the mass of the cable end is not nearly as great as a housing. Dropping a cable end with an exposed plug will usually not render the plug out of round whereas a chassis mounted plug that takes a direct hit will usually get damaged. Of course within these, manufacturers usually offer even more options. For example, a chassis mount receptacle may be flush mounted or it may extend from the chassis. Most chassis mount connectors use a single locking nut, others use 2-4 screws around the perimeter. Here are the trade-offs to consider. Obviously, cables will need an inline connector. Chassis mounting is less obvious. Having the mounting features (nut or screw) on the outside of the product will allow it to be re-tightened if it were to ever come loose. But, this can be a security risk for very sensitive equipment handling encryption or financial transactions. Having the nut or screws on the inside keeps users from tampering with them, but then we need to keep in mind that whatever electrical connection we need to make will have to fit through the hole in the chassis from the outside. Finally, while designing rugged products, we need to consider the system. If a product will regularly be used with a cable attached, we need to consider what leverage the mated cable will impart to the chassis. Long strain relief on cables are great at preventing damage to the cable, but since they are long they can put extra strain on the chassis. There are no hard and fast rules, we just need to use good engineering judgment and consider the whole system when deciding how to mount connectors. Moving the connector off the chassis with a short pigtail or flying lead to an inline connector can be an option in some products. That’s usually only acceptable if the pigtail in question will always be mated. In rugged environments, cables get pulled on, snagged, tripped over, shot at, and accidentally sliced. As designers, we can’t do much about stray bullets or paratroopers removing zip ties with a knife and cutting through their cables. But, good cable management can reduce some of the snag hazards. Still, cables will be abused and we need to mitigate damage and unintentional disconnects. Our usual preference is for quick disconnect connectors which breakaway when a set amount of force is applied. Snagging on a cable that won’t breakaway can be dangerous to the user and less importantly it can damage the product. Breakaway or quick disconnect cables can often be specified with high or low force. Glenair, for example, offers their Mighty Mouse connectors in breakaway forces of 5, 10, and 15 pounds. For applications where there aren’t safety concerns and physical locking is appropriate, there are pull-to-disconnect, turn-to-lock, and push button latches to name a few. Non-Rugged products often mount electrical connectors directly to a PCB and then just cut an access hole in the chassis for clearance. This may be fine for a small USB hub that sits on a desk, but in a rugged environment, it won’t be long before that connector breaks off the PCB. For rugged applications, it’s more common to use an external connector that is chassis mounted, and then some internal flying lead. In this way, external impacts on the connector won’t cause damage to the PCB. The two common options are discrete wires and flex circuits. In either case, the PCB will have a small, less rugged mating connector attaching it to the flying lead. Discrete wire rugged connectors make their electrical connection with crimp contacts or solder cups. Flex circuit flying leads are usually soldered directly to through-hole PCB pins on the rugged connector. The flex circuit then comes off the back of the connector at a right angle which can be a great space saver in some designs but makes it nearly essential that the connector installs to the chassis from the inside with the retaining nut or screws on the outside. The flex is usually too large and awkward to fit through the mounting hole. In very high vibration designs, it may be important to reinforce the internal connections with potting compound. That’s a good reason to keep internal connections as light as possible and secure any discrete wires. Many rugged products have difficult EMI requirements. Full 360-degree metal shielding might not alone be enough to pass MIL-STD-461 or Tempest, but it’s usually a minimum requirement. For chassis mount connectors, this means getting good all around electrical contact between the connector shell and the metal or shielded plastic housing wall. For inline connectors on cables, a combination of high-quality braid and foil needs to be electrically connected around the connector shell. This is accomplished with a metal backshell, a metal band like a BAND-IT, or a crimp sleeve. Once we know the environmental requirements for a rugged product, we can decide on a connector material and finish. Plastic connector shells are not common in rugged applications but could be useful in extremely corrosive environments where shielding is not needed. More often, stainless steel and aluminum are the material of choice. With each of these, there is a host of finish options which will be selected based on appearance, corrosion resistance, and RoHS compliance. Common colors are chrome, black and olive drab and there are usually a few variations within each of these colors. Here is a list of 23 options Glenair offers. Note the different substrate materials, colors, RoHS compliance and salt spray values. Salt spray tests are a standardized measure of corrosion resistance. A designer must consider the conops for each connection and determine how many mate / demate cycles each connector will endure in its lifetime. Manufacturers will rate their connectors for a number of cycles. I’ve personally seen test cables exceed those ratings by 10x, but those were in a controlled environment and we should not assume the manufacturer has been overly conservative. problem with any connector, but especially fine pitch connectors. Dust caps are usually a must in rugged environments. Most manufacturers offer a few styles of dust cap, but we’ve occasionally had to make our own to fit a unique application. Users will inevitably forget or ignore dust caps which is why it’s critical to have sealed connectors that can be cleaned out. If mud gets into an unsealed connector, good luck cleaning that out without contaminating the product. Lastly, if a product is part of a system with many cables, we need to consider keying. Keying keeps similar cables from being accidentally plugged into the wrong receptacle. Incorrect connections cause malfunction or electrical damage so unique keying is important. Small fine pitch connectors can be hard to mate if the user can’t tell which orientation fits. Commonly little color-coded dots or lines will help the user find the right receptacle and orientation. For plugs that need to be mated without looking, large tactile indicators help the user find the receptacle even with gloves on.